It’s time to present another of my Portfolio holdings – Criteo. Criteo was founded just over 10 years ago and has in that time grown into a billion Euro revenue company. Back in 2005-2006 Criteo developed a sophisticated machine learning platform that analyzed user behavior. The company applied this to movie reviews as well as e-commerce purchases. The problem was that they could not figure out how to make money on them. So the founders started to look at other markets and saw that the adtech industry looked like a great fit. But then again, there was no shortage of adtech operators gunning for the opportunity. In other words, Criteo needed to find something compelling to set itself apart. Keep in mind that – at the time – the adtech market focused on charging for ads based on fuzzy metrics like ad views. But for the founders of Criteo, this seemed really odd. Why not build a system that only billed customers when there was actual performance that drives sales? This was a big idea and disruptive. The inner works of how Criteo creates its ad technology is not easy to comprehend. But looking at their growth figures it is obvious that they do seem to have an edge in this field. They employ a large number of PhD’s to build their systems. The more clever people they hire, the more their system seem to scale. I try to disregard from the complexity of how they build their systems and look at the facts. My investment thesis is fairly simple. This is an extremely high growth company with a long proven track-record of growth. Right now all their revenue is plowed back into the business, to grow it further. When the company reaches a more mature stage and the growth slows down, they will have the ability to increase margins significantly, and a lot of that juicy revenue will fall down to the bottom line. 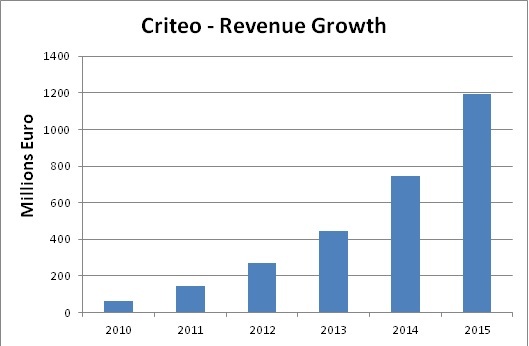 Since Criteo started in 2005 they have pulled some amazing growth numbers – an average yearly revenue growth rate of 78% (over 5 years). With these growth assumptions and the current pre-tax operating margin of 6%, the company is fairly valued today. If the company can either increase operating-margin or keep growth above 25% the investment-case for this company quickly starts to look very good. 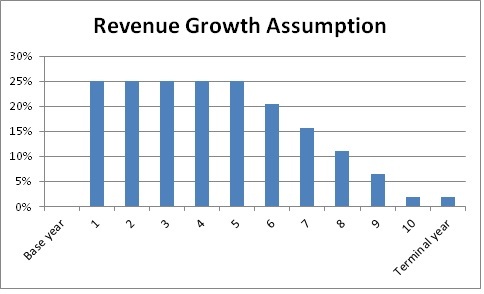 The operating margin and the growth rate are of course interlinked. Since money is spent on R&D, this lowers the operating margin, but the R&D is what creates the tremendous growth. To understand the dynamics in the valuation let us pretend that the company ceases all R&D spending. This would lift the operating-margin to 12.5%, and again to comparing to today’s stock price, the company would need to keep growth at about 12.5% per year. I believe the company will be able to achieve a 30-40% growth in 2016, growth will thereafter slow from these extreme levels, but the company will also be able to achieve operating margin increases, all in all this spits out a valuation target in the range to 50-60 USD per share. 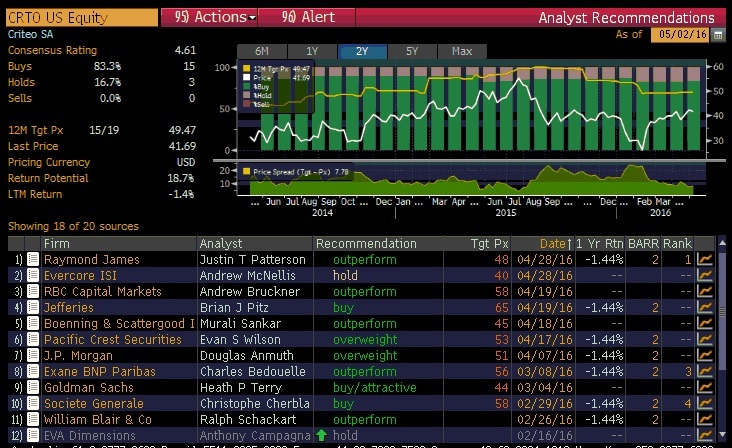 I set my price target at 55 USD per share.